Join Our Sponsors for 2017! Financial donations (tax deductible) are crucial to covering the costs of the Ocrafolk Festival. Sponsors help us pay for the performers, production companies, tents and chairs, porta-potties, programs, etc. Although April 30 is the printed program deadline. We can accept donations at any time and always add your name to our website (we can sometimes squeeze you in to the program after the print deadline, so don't hesitate to ask us). Thanks for your support! Questions? Please contact the festival coordinator, David Tweedie, at 252-921-0260 or info@ocrafolkfestival.org. Cash and check donations may be mailed to "Ocrafolk Festival" c/o Ocracoke Alive, PO Box 604, Ocracoke, NC 27960). To view/print out a pdf of the Ocrafolk Festival Donation Form click here (2MB). Once you have filled out the form and determined your sponsorship level, click here to fill out the rewards form. We accept credit card and Paypal donations through this page. Scroll down the page, or click on a supporter level here to view the great rewards! Click button to sponsor this level! NEW! Recognition on back of T-shirt. Print deadline April 15. NEW! 4 Tickets to the Ocrafolk Festival Admiralty Party & Cruise aboard the Skipjack Wilma Lee on Saturday, June 3. NEW! 2 Tickets to the Ocrafolk Festival Admiralty Party & Cruise aboard the Skipjack Wilma Lee on Saturday, June 3. You are in control & get to choose your donation amount! You will be eligible for the rewards level that you have achieved with your contribution. Contributors in the $20-$44 range will receive a 2017 Ocrafolk Festival General Admission Button. Contributors in the $45-$49 range will receive a 2017 Ocrafolk Supporter Admission Button. Ocrabucks~ This is a fabulous way to support the Ocrafolk Festival while you are visiting. Purchase "Ocrabucks" from the Ocrafolk Festival ($1=$1 Ocrabuck) , and you will have a until midnight, Monday, June 5 to use them at participating restaurants and at the Ocrafolk Beer/Wine Garden. Merchants who use Ocrabucks will donate %10 of the sale back to the Ocrafolk Festival. You get to show your festival pride and partner with us to support this fabulous event! Please note that Ocrabucks are non-fundable and no change is given for purchases made with Ocrabucks. Thank you! Click button to join our dockside party! Ocrafolk Festival Admiralty Party and Cruise aboard Ocracoke Alive's Skipjack Wilma Lee ~ (Saturday, June 3, at Ocracoke Community Store dock from 6:00-7:30 PM). Support the Ocrafolk Festival and step on board Ocracoke Alive’s flagship, the Skipjack Wilma Lee. This special dockside fundraiser is limited to around 30 persons and will feature hors d'oeuvres, drinks and live entertainment. Tickets are $75 per person or are available by becoming a Premiere or Program Level Sponsor. You must RSVP since space is so limited. Contact info@ocrafolkfestival.org if you are interested in joining us on this virtual cruise! Live Oak Stage Saturday Evening Concert (Performers TBA) ~ The Live Oak Stage Evening Concert is held on Saturday night, 9:30-10:45 at the Live Oak Stage. It is a very popular event! Premiere through Patron level sponsors are eligible for a limited reserved seating section at the front. Donald Davis Storytelling Evening ~ Saturday night from 8-9:15 PM at the Ocracoke Community Center, festival attendees can be part of an intimate storytelling session with Ocracoke's own internationally acclaimed storyteller, Donald Davis. Certain levels of sponsorship will receive a ticket ahead of time reserving them a place in this limited audience (all seating is general). Any tickets remaining will be handed out for free on Saturday morning at the Ocrafolk Festival Info Booth. When they're gone, they're gone! If you have a ticket, please be prepared to be in your seat by 7:45. Once the show starts, latecomers may be held at the door. 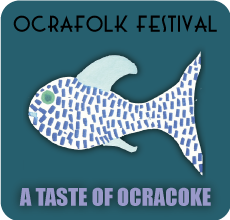 "Ocrabucks" & the Friday Night "Taste of Ocracoke" ~ (Friday, June 2, 5-7 PM, Ocracoke Preservation Museum) The Friday night "Taste of Ocracoke" features local restaurants with small plate samples of some of their finest cuisine. The festival will be selling "Ocrabucks" ($1=$1 Ocrabuck) that you can use to purchase these fine delicacies. In addition, you will be able to support the festival by using "Ocrabucks" at participating restaurants around Ocracoke Village throughout the weekend and into the following week. Dessert will be free at the Ocrafolk Festival Art Auction, to be held at the Berkley Center (Tentative). Gift Certificates for Drinks at the Wine/Beer Garden ~ Ocrafolk Festival has wine/beer available at Paddy's Holler Beer Garden on Saturday as well as at the Friday Auction and Friday and Saturday night events. As a sponsor, you may use your Beer/Wine Tickets for refreshing beverages during the weekend. Tickets must be presented by an adult 21 or over. ID may be required. Patron Festival Ts ~ Festival T-shirts usually sell out over the weekend. If you are Patron, we want to make sure that you get the size and color of shirt of your dreams! Please let us know what size and color you prefer. If you are coming to the island for the festival weekend, we will have your Sponsorship Packet at the Friday check in or the Saturday Ocrafolk Festival Info Booth available for pickup. We are still tweaking the design for this year's T-shirt. We will post it when it arrives!